Yes here was I thinking that Blancpain produced only round case watches. 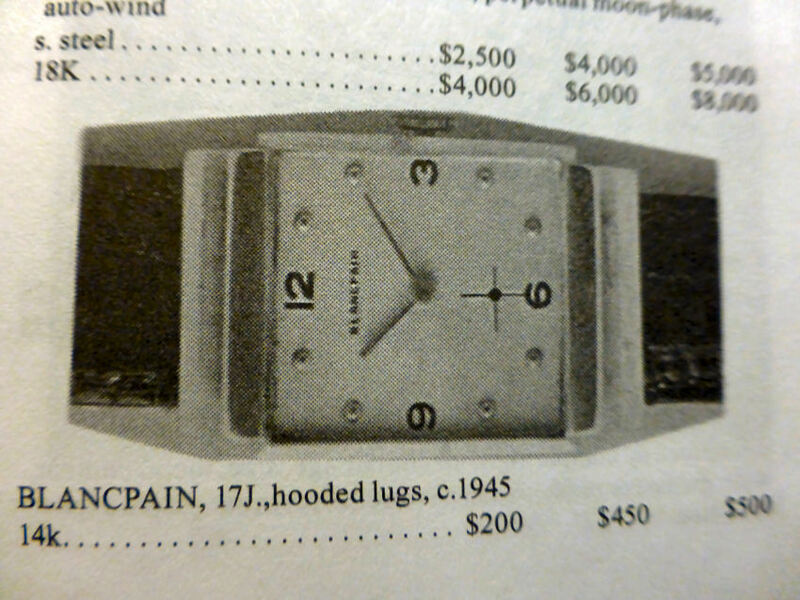 I checked around however and with some difficulty it has to be said I did find an image example in my old No 30 Edition Gilbert, Engle & Schugart “Complete Price Guide to Watches” on page 677 right at the foot of the page, an image of almost the very same model. It too has hooded lugs, though shown complete rather than the part hooded ones of my version. However the dial is exactly the same, stick hands dot markers and the tiny sub-dial seconds, plus the 4 cardinal numerals. The glass is unscratched and domed and the solid 14k Gold case is in great condition. 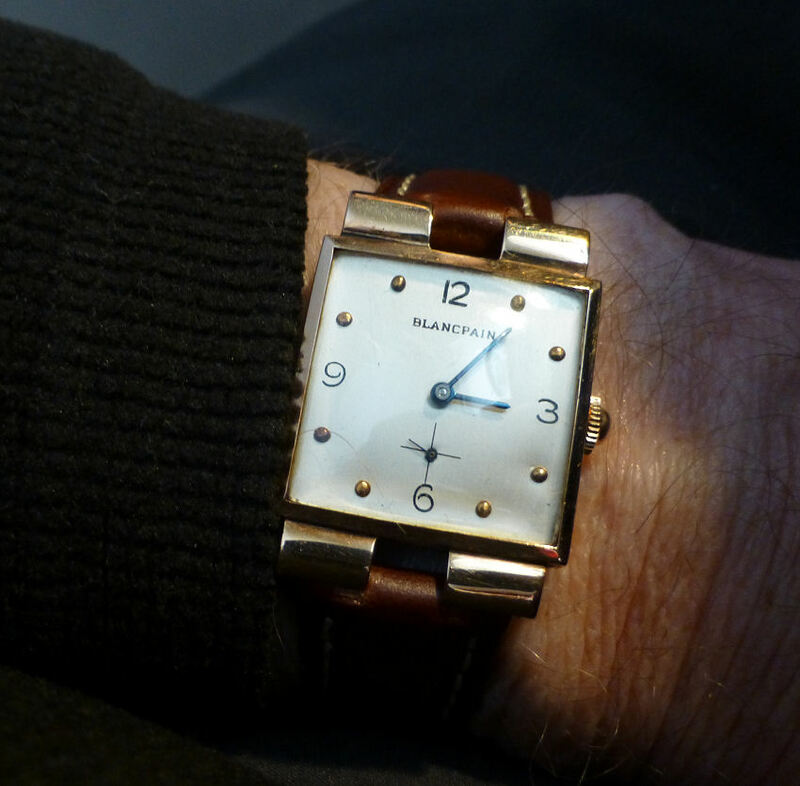 A degree of re-finish is evident and why not as this watch is from around the 1940-45 era. The strap is not a Blancpain but a modern Italian leather Rosario 18 mm that looks just fine. As always with any watch I collect – it has to be worn on the wrist regularly and Rosario straps are always comfortable. The movement which is in superb condition is signed Blancpain 17 jewel unadjusted with the Rayville SA import mark clearly shown (KXO). I’m not sure if Blancpain even made their own movements in this period and the movement looks very similar to an A. Schild. It does look as if it could be related to the AS 970 for example, though I’m no expert on these and there were so many AS movement variations, I can’t definitely put a number to it, but they were of very decent quality for the period. 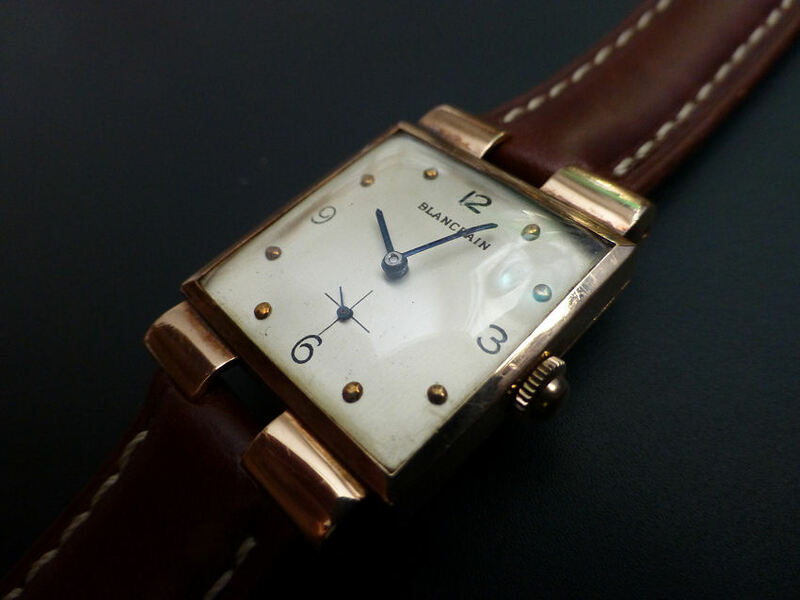 1940s Blancpain signed 17 jewel – perhaps Anton Schild. The case has been cleaned up at some point in the past, but the Case Maker marks show up clearly to be Katz & Ogush Inc of New York, who were registered in 17th January 1921, and denotes the 14k Gold motif. K&O had two different motifs – the other was simply plain text with their initials, so this is a nice bonus for me as I have a thing about Watch Case Maker marks. When I first saw the images on Auction I thought perhaps this was a Ladies model, but the watch overall size at 26 mm x 35 mm lug to lug, is definitely for a Gent. It was also produced at the time when the “formed” watch style was coming in to fashion, as they moved away from the traditional round pocket watch style of earlier times. Of all the shapes around at the time and into the fifties, the square and rectangular became the most popular and are still with us today. So to say I was pleased in an understatement – I am delighted with my vintage find this month. It’s not often you find a rectangular Blancpain and movement wise it is in great condition, the case is clearly marked with a known Case Maker and it’s in good condition – it also keeps excellent time which is another bonus. The question of absolute original condition and refinished condition always comes up when collecting vintage watches. It is a fact that to find watches in “perfect” condition of this age is becoming almost impossible now. 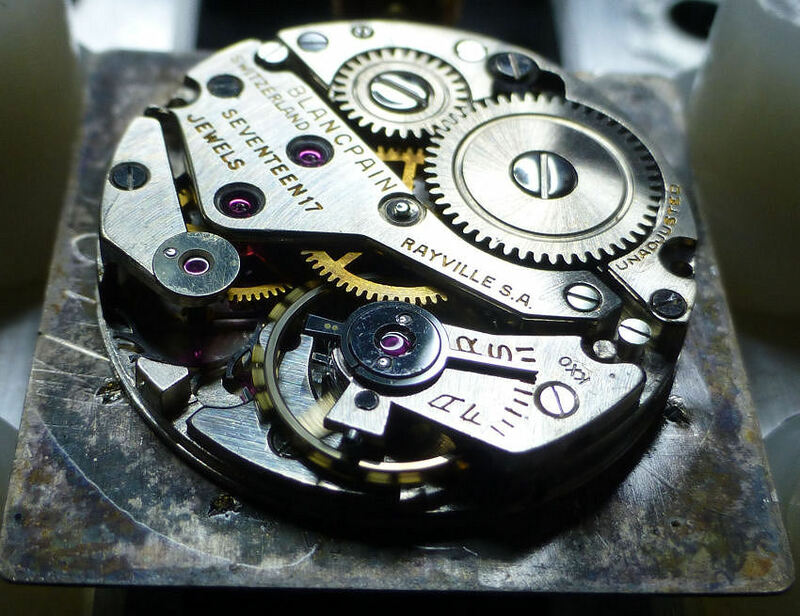 More often than not the watch is in various stages of poor condition, corroded movements, spotted dials, mechanical damage, scratches and dents and certainly not looking at all as it was when made. The question you have to ask is – Do I want it looking like that? And in my case – Do I want to wear it? Personally as a “wearing” watch collector, I prefer the watch to look more or less as it was. And I don’t mean completely refinished in such a way as to look false, but rather cleaned up sympathetically, basically to show the attributes of the original watch. I also don’t mean to replace everything on it, but where possible to refurbish the existing elements to best advantage. The only time I would tend to accept the absolute original, would be for very much older pieces, such as a few pre-1900 models. I have some and these 1800’s models are about as original as you can get and “as found” and are the only watches I own that I don’t wear. They are (unfortunately) for display purposes only. I suppose I got these when I first started collecting and had this exciting “purist” idea, but I soon found that firstly it was a VERY expensive and perhaps over-optimistic collecting idea. Secondly I realized that wearing watches was my real passion so had to revise my strategy and not look too far back – and of course it’s cheaper! But for me, more fun . . . . . 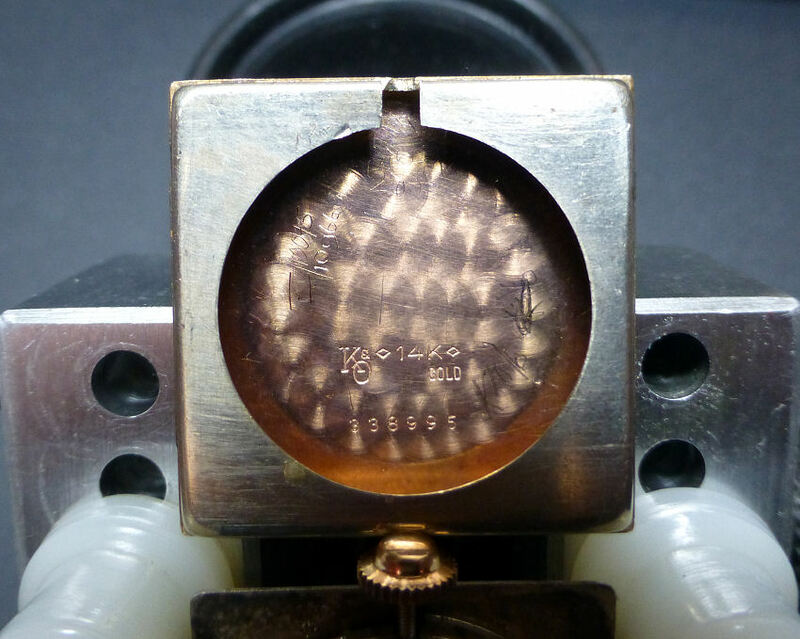 Note – One of the problems with vintage watches is the degree of uncertainty when checking them out. You have to be a bit of a detective and maybe a skeptic too, which is a pity. It would be so nice to accept things at face value, but that would be unrealistic. There are some things on this model that could make you wonder, one of which is evidence of machine holes/marks on the rear of the dial. Are they related to the fitted movement and dial? Well yes they are in this case and are actually the reverse of the dot marker positions on the dial. If you look closely at the markers they are not just “applied” markers, but are in fact punched “through” the dial itself. And that’s about as permanent as you can get. So maybe after all this is me being too Sherlock Holmesy, but this sort of thing does makes you question – But as i say happily every aspect of this case and dial was perfectly consistent with the watch. Though had they not been you have to remember it was the middle/end period of the 2nd World war, watch cases and parts may not be easy to get and to assemble a complete watch might well involve a certain degree of “mix and match”. I might have to go along with the fact it may – and I say may – have had a very light and sympathetic dial refurbishment and that is absolutely fine by me – in fact I love it. So after close examination I think I’ve got myself a really nice and genuine example of a rather rare watch – AND I can wear it – so I’m happy.